Sing For Hope Piano "Ribbon Cutting"
I felt privileged to be a short part of these students lives - to hear them sing, and to know that the piano I painted with Sing for Hope will help them grow stronger along their own musical journeys. Today I was privileged to be a part of the "Ribbon Cutting Ceremony" for my painted piano. To use a musical phrase, this ceremony was the elision* to the largest public art program in New York City: Each and every one of the 50 Sing for Hope Pianos has been permanently homed in an NYC public school after their musical sojourn through the City's parks and public spaces. These pianos will now go on to have a new and resounding life supporting kids who love to learn music. The Ribbon Cutting Ceremony began with a song sung by the RHS choir. They performed "Take Me Home" by Pentatonix - with a raw interpretation full of urgent anticipation and crisp harmonics. Then, Sing for Hope's representative Paula Nemerson introduced the students to what Sing for Hope is all about: bringing the power of music and the arts to places where it's needed the most. Then I explained the story behind my piano - just before cutting the ribbon - and volunteer musician David Chang performed "Castle In The Sky" from Hayao Miyazaki's beloved anime film. After this brief but meaningful ceremony the students told me they'd "name the piano Christine" after my sister. In my short presentation telling the students how the piano came to be, I explained how I used my sister's funeral bouquet as the imagery for a beautiful painted instrument, transforming grief into joy. As part of the largest public arts program in New York City, the 2016 Sing For Hope pianos - all 50 of them! - were placed in "permanent homes" in NYC public schools. 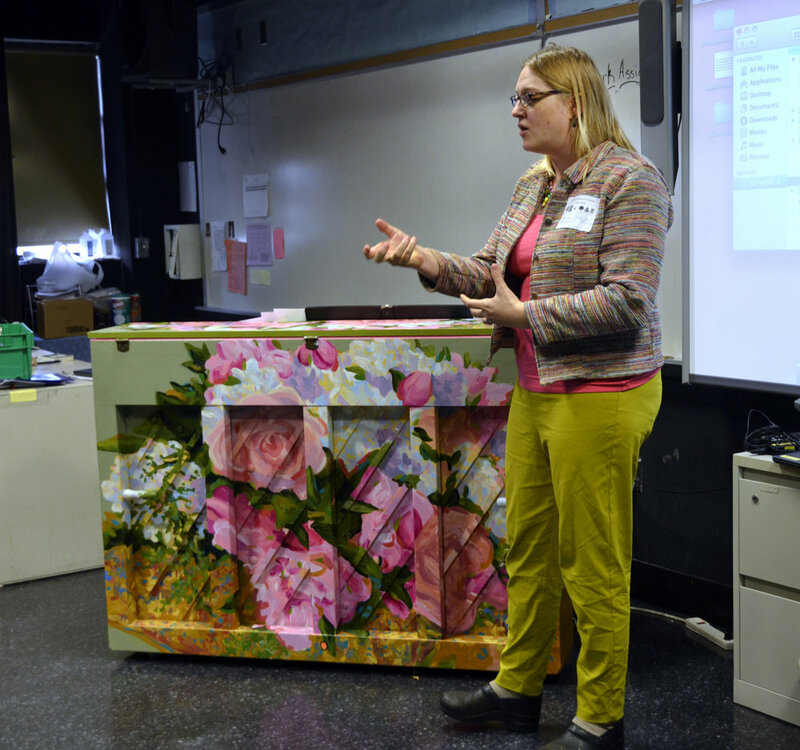 My painted piano, "Consola," was placed at a high school in the Bronx. During the "ribbon cutting ceremony," pianist (and Sing For Hope Volunteer Artist) David Chang shared the main theme from Hayao Miyazaki's beloved anime, "Castle In The Sky." My piano was placed in the Renaissance High School for Musical Theater and Technology in the Bronx. Mark Galante, the Advanced Choir's conductor, wrote an application for a Sing for Hope Piano as part of the competitive process to be considered as a recipient for the instrument. Here we all are, with their new Sing or Hope Piano!